I remember the first model kit I built, as a young child. It was a P51 Mustang Snap Tite kit that I put together with my father. 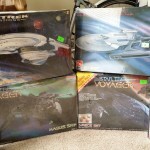 As I grew older, I put together many model kits, to varying degrees of success. Many times I would get impatient, and you would see finger prints in smeared glue, sometimes on clear plastic, and weird folds in the water slide decals. No matter how bad some of them were, for the most part, I enjoyed building. As I got older, and started hitting conventions, I found out about “garage kits”, or bootlegs of movie prop replicas. Through high school, I kits for, and built, phasers, communicators, rifles, and all sorts of greeblies and doo dads. My personal favorite booth was always in the corner of Starbase Indy, and they were called Paraphernalia From Beyond Planet X (don’t Google them, I think I’m the only one on the Internet who’s ever mentioned them!). This place had resin kits from Star Trek, Star Wars, Doctor Who, The Prisoner… anything that your average con-goer in the mid-90’s would want. The thing I loved about these kits was, they didn’t have many small parts, or water slide decals! However, I still needed to learn patience, as I still have kits with fingerprints in spray paint, not completely smoothed filler, and a lot of “close enough” attitude that I am now irritated about. Cue up the year 2000, and I had the opportunity to work with some very talented people out in Burbank, California. While I was there, I not only learned a bit about practical film effects and creating items using materials such as silicone, fiberglass, foam latex, and resin, but I also learned some of the finer points in prop building. While out there, I helped work on licensed replicas from the original Battlestar Galactica, Terminator 2, and Alien, all teaching me how to properly fill air bubbles, slowly and carefully sand down seams without removing too much of the actual prop, and how to properly mask and paint a piece using either a rattle can (spray paint) or an airbrush. However, I still get in a bit of a rush, which is part of what I want to work on, now. Here is a picture of the pile of model kits and resin that I currently have sitting around my house. Some of this is from time spent in California, some from all the way back to high school. 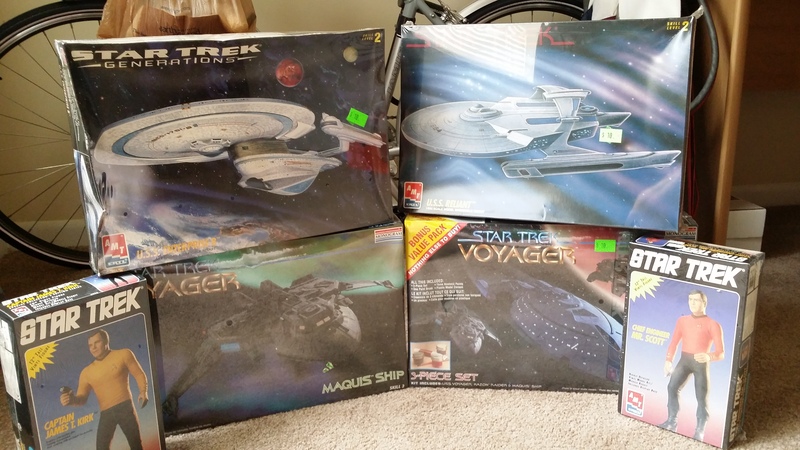 The model kits were purchased at the Indiana Toy and Comic Expo back in 2014, and have been waiting patiently for me to crack them open and get to work on them. The 3D printed Pip Boy was a gift from Devon Pike, who picked up a printer from SeeMeCNC at Appleseed last year. I also completely, and unintentionally, copied the model box set-up from the initial picture I took of them, back in 2014. 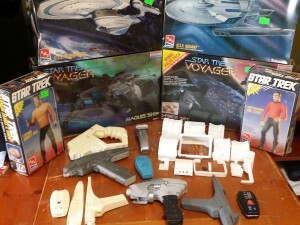 The first item I’m looking at taking care of is the USS Reliant model kit. I’ve reached out to the General Modeling Forum over on the RPF, looking for information on how to make this model look at least a step above what just comes out of the box. I’m also looking at starting to get the Pip Boy prepped, and cleaned up, and keeping it in reserve in case I get stuck on the Reliant, or start getting burned out looking at one project. As I start working, I’ll document the progress, including mistakes, both on here and on my YouTube channel. If I get enough posts, and enough interest, I’ll go ahead and start up a “Building” page on here, as well. We shall see, though. As I’ve said before: Too many ideas, too much cool stuff, not enough hours in the day.